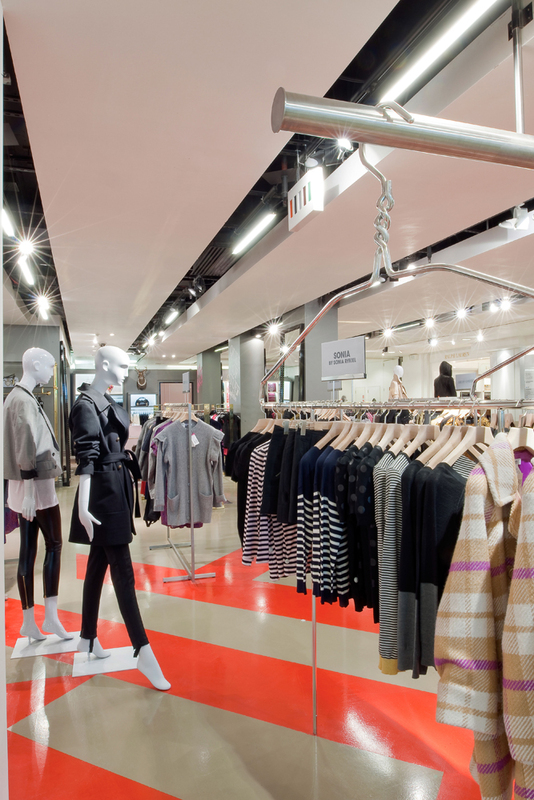 FAT have redesigned Selfridges new contemporary womenswear department in the landmark Oxford Street store. The floor is organised around three main areas. The first is Europe's longest denim wall. Here a canopy, formed by a seemingly chaotic explosion of timber struts frames the space. Both raw and expressive, the canopy plays against a background of sharp graphic legibility formed by the denim shelves. Visual languages of direct pragmatism and more glamorous theatricality are combined to explore the dialogues of workwear and luxury that run through contemporary denim design. 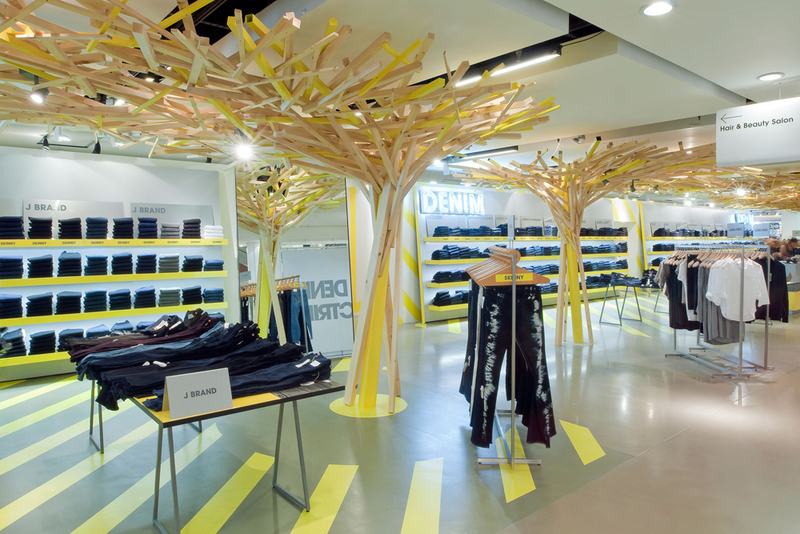 Selfridges' Basics area plays on the idea of ordinariness made strangely special. A series of overscaled coat hangers become a surreal means of display (so that normal sized hangers hang from their giant cousins). Crates and boxes become pop-graphic plinths through the use of dyed wood laminates and planks of formica. The contemporary area is a space that introduces new and experimental designers. It is defined by an orange poured resin spill and a chromed frame outline of a house creating a flexible, customisable space that works like a shop-within-a-shop, allowing brands and designers to take ownership of the space. 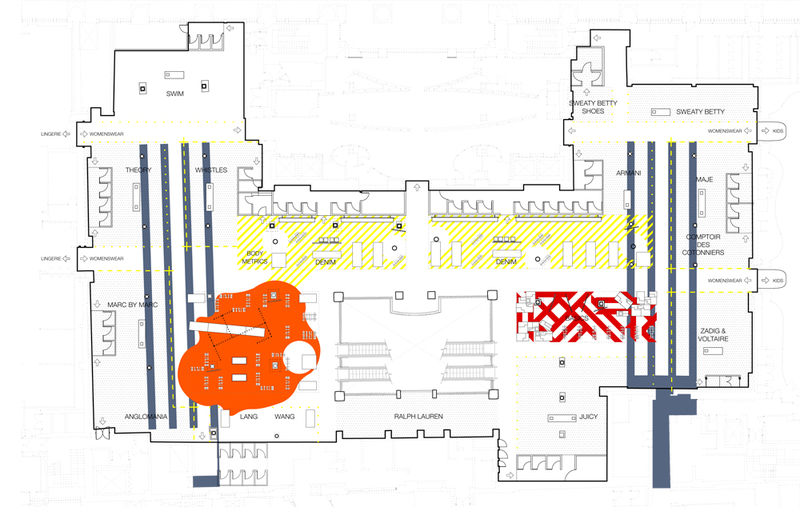 Around these anchor points mats for brands including Vivienne Westwood, Alexander Wang and Zadig and Voltaire respond to FATs design guidelines. Giant billboards apparently lean against the perimeter wall, providing a consistent horizon to the space. The space is characterised throughout by painted floor patterns recalling abstracted and overscaled industrial markings. Tables and plinths develop a consistent language linking the varied areas.